Hopefully I'll do a better job of reporting on today's news than earlier this week. The volume has overwhelmed me a bit this week, but I'll get cracking. Just to mention this mid to larger cap, in passing, as it's such an interesting situation - the maker of posh tonic water & other premium mixer drinks. Shareholders can breath a sigh of relief this morning - with a positive trading update. Growth in the UK has been strong, at 52%, and international growth also looks to be taking off well. We're not seeing many trading updates like that at the moment. The £3.2bn market cap may look like madness, but not if it continues growing this strongly. Revenues may be relatively modest, but its operating profit margin is very high. The forward PER isn't as bonkers as it's been in the past, either. Stockopedia is showing consensus of 49.2p for 2018. "Comfortably ahead" possibly means 52-53p, at a guess, making the 2018 PER about 53. Fro 2019, I imagine forecasts will be increased - I'm inclined to pencil in 60-70p EPS. That equates to a PER of between 40-46 - high, but not outrageous for a growth company that is performing very well. My feeling is that growth company shares now resemble playing Russian Roulette. The slightest disappointment, and you wake up to an instant 50% loss. Whereas, as we've seen today, an out-performance update has only added 7% to the share price. That doesn't seem terribly good risk:reward to me. This clarification type statement seems to be telling Flybe shareholders that the game is up, and that the derisory offer of 1p per share from a consortium including Virgin & Stobart, is the only option. Share prices seem pretty mad recently, it fell from about 4000p to around 2150p, which did not make sense to me, as no bad news and they always seem beat the forecasts. Shares are now up over 14% today, I think yesterdays fall was nervous investors selling before the update. Yes I agree many shares have bounced in the last month. It's very difficult to know what to do, I have just sold my Fevertree Drinks (LON:FEVR) holding, too difficult to predict which way they will go in the next few months. Any thoughts on cybersecurity specialist NCC? Down 25% on today's news. Agree Fevertree Drinks (LON:FEVR) are difficult to read mid-long term. I've sold off some but kept the rest, hopeful of a good run (once the hysteria dies down). I've put the proceeds into Learning Technologies (LON:LTG) which is currently bouncing back nicely from its recent panic fall of over 24%. Very choppy at the moment with sudden falls, followed by sudden bounce-backs (which is not a good sign, mid term). They seems to be over-reacting, and over-correcting before reverting to the mean. Who came up with that efficient market theory!?. Seems there are good trades to be made at the moment in following the rebounds (as Paul has recently said). Oh, come on... Am I the only person who reads the SCVR to kick tyres, discuss the merits of companies and discover things I hadn't previously considered? Clearly there are contributors much cleverer than me trading in and out of things. I have no interest in who's trading what and it just clogs up the comments section. If you want to wave your willies around, please go somewhere else. I guess you are including me in your comment? I too like to discuss the merits of companies and discover things I hadn't previously discovered. I also trade when the conditions are right. As, I'm sure many others do. This discussion section isn't here just to exactly match what you want. Its for everybody. Investors and traders. Personally, I like to do both. Some people have said they unfortunately missed opportunities, so mentioning shares on the move is not and should not be out-of-scope. Fevertree was raised by Paul in the SCVR, btw. For example, I'm interested in efinancials comment about NCC falling 25%, as a previous holder I'm now going to take a look to see if I can see a reason and see if they may bounce back. So, I won't say if you don't like it go somewhere else, as that is selfish, Its for everyone. What I would say is just read the comments that YOU are interested in, and understand that the ones you are not interested in may be of interest to others. So, no willy waving as you put it, just legitimate sharing of info. and current thinking (without malice). Second vote here for thoughts on NCC (LON:NCC). The 25% SP fall today looks like a major over reaction. I suspect it relates to reported "softer demand" in the UK escrow / assurance business. Compensated by growth in the US I felt. Cash flow from operations reports a sharp decline, looks like troubles in their working capital for the first six months, but only timing as it will reportedly reverse by year end. Third vote for NCC (LON:NCC). The report shows Revenue and profits are both up (maybe not as much as market expectations). Interested in Oldschool05's obsrvation re: Cash Flow. Thoughts appreciated if you get time. I have been watching the steady upward climb of UP Global Sourcing Holdings (LON:UPGS) with some relief, as it mitigates some of my paper loss so far. I was influenced originally by the stocko stats on its return on capital etc, plus the dividend, and then the Chairman, and one other Director, I believe made a big personal investment. Unfortunately, a profit warning followed. I like to believe I am not the equivalent of the grim reaper for share investment, but it does seem to follow that I invest, and then the share/market bombs out. Anyway they they recent held an open day visit to their Oldham premises for their investors which was quite popular. I hope the CEO is not trying to hype news to improve the share price, as it should be a decent beat to justify an early announcement. Given the apparent strength of balance sheet at the times of previous reports, ie there was no inference of imminent insolvency, then if the main reason to accept a derisory £2m bid for the entire company was to avoid going bust I would be inclined to seek an investigation into whether management were accurately reporting the financial situation in the first place! As I understand it the largest institutional shareholders are spitting blood and presumably would have voted against the deal. Management reaction to this appears to be a two fingered salute and use a downgrade from premium listing to standard listing to effect the takeover anyway by another means and dispose of the entire business without a vote!!!! That is unbelievably arrogant and horrendous governance in my opinion. How it is even legally allowed flabbergasts me. It is a blatant disregard to its owners - ie shareholders by a management (custodian) that owns a minuscule amount of the business. I believe that major shareholders are potentially seeking an injunction to stop the sale and presumably remove the board. Who knows if this can succeed, or indeed even in time, but I suspect they represent 50%+ shareholders so must have some weight in a court one would imagine? Then add the ex Stobart director, Tinkler who bought 10% of the business after the announcement at around 3p I think. There is no love lost between Tinkler and Stobart (he sold £5m worth of Stobart shares a few days back too) so clearly he has either designs on the airline or some sort of plan. The plot thickens. Not sure how this plays out. Interesting to see management put out a statement today titled "Overview of offer" which, for me, added absolutely nothing. The cynic in me says it was a statement designed to floor the shares in an effort to take the wind out of any injunction effort. I consider the whole thing to have been handled absolutely disgracefully. 5th call for NCC even though I am going to add at this price. My personal opinion is that the balance sheet was very week from a going concern basis - ok enough for them to say at a moment in time they were a going concern for 12 months but no more. But the minute you say that the clock is ticking to the point that this may not be the case if you can only just survive for 12 months. If no one has come in to buy the company in the meantime that says it all. any company with ongoing losses is going to be in an obvious hole. There was very blunt honesty about raising scraps of cash and having issues convincing their card provider that they were a sound company to use. If you think the balance sheet is good add up the liabilities numbers and show me how they would have anything left after paying down all their liabilities - the numbers dont stack up to me unless there was a going concern with the business in which case they cant ditch all the assets. To me the only obvious route was a rival bidder willing to splash the cash their is none. I would be interested to look at any numbers you can present though to backup your argument. I really am gobsmacked though that anyone is surprised that a loss making business with 480 mill of money owed out throws in the towel, look at easyjet and the £15 mill down the pan with drone losses- this company was not fit to carry on trading in form it was doing for much longer. If you want another example - look at how much they lost a few years back with those planes they couldn't use of utilise - how does that work with a whole fleet of aircraft when they throw in the towel? "In line with our strategy, we reduced seat capacity in the first half by 9.0% delivering a 7.2% increase in revenue per seat. Continued improvements are being seen into quarter three which demonstrates the popularity of Flybe for our customers. However there has been a recent softening in growth in the short-haul market, as well as continued headwinds from higher fuel and currency costs. We are responding to this by reviewing every aspect of our business, especially further capacity reduction, cash management and cost savings. This is already starting to have a positive impact, as shown by the improved first half adjusted profit before tax; however, we must do more in the coming months. We remain confident in the vital role that Flybe plays in UK connectivity." "sale of the headlease and underlease of the Property in return for a payment to Flybe Limited of £5,000,000 (plus VAT);"
None of that says "we are bust in the next 3 months- please bail us out for £2m or 40% of the proceeds of the sale of a lease!!!" When there is an "emphasis of matter" statement in the auditors report (as there was in the half year results for Flybe (LON:FLYB) ) regarding the going concern status of the business, I think it is self evident that there was a very real it was headed under. Yes, it had cash and cash equivalents of £54.2m - but lets be clear, it's overall net debt position was £82.1m representing an increase of £23m from the year end. Some of this move will be down to the seasonality of the business but not a great look. The cash outflow of £15.2m in the half year was from operating activities. In the 1st half of the prior year this was just £0.7m so the cash outflow has gone through the roof. So some of the key numbers were going alarmingly in the wrong direction. This is in the context of liabilities of liabilities of 482 mill !!! The cash of £54 mill doesn't even start to make headway into that - i really can't think of any headway being made while they continued to be loss making. This is always the problem with high "trade payables" and loss making companies - suppliers become twitchy and rightly so. H1 profit - yes but we have known since last summer they are expected to make a full year loss - therefore the H2 loss was expected to be over £7 mill - and the expected loss has crept up over time so it was expected to be much higher than that. If you want the full stark warning that the company may not survive it has been there in black and white since 14/11/2018 when they said the following - the last paragraph lays out the position pretty bluntly - particularly where they they also said earlier there was a chance the card acquirers may do that very thing. If they can't afford to give card acquirers extra cash the obvious inference is that they don't have much extra cash at all to cover anything materially worse than their plans at that time. Since September 2018, the Group has provided partial collateral to its two main card acquirers. As at 13th November Flybe has provided £16.2m total cash collateral thus lowering unrestricted cash available to the business. There is a risk that card acquirers may seek greater protection and thus more cash collateral in the future or terminate with notice. Existing card acquirer contracts enable them to call for up to 100% cash collateral and additional card acquirers are actively being sought. If the Group's card acquirers were to choose to seek significantly higher cash collateral and the Group cannot access sufficient additional liquidity, this would give rise to a material uncertainty which may cast significant doubt about the Group's ability to continue as a going concern. It's actually worse than that. The acquirers would only want more collateral because their risk and underwriting teams have determined that the likelihood of default has increased. Acquirers are the organisations that accept card payments from merchants (Flybe in this case) before sending them onto Visa or Mastercard. Under the international payment scheme regulations if a merchant fails to deliver goods and services and is then unable to reimburse their end customer then the acquirer is obliged to step in and make good the debt. To handle this acquirers have teams of risk managers whose job it is to look at the risk associated with their merchants. So basically, if an acquirer wants more collateral it's because either its risk team has determined that the merchant's credit risk has increased and they want more money to cover any defaults or because the merchant is doing really, really well and they're making more card payments than the underwriting covers. In Flybe's case it was always obvious it was the former not the latter. Thanks for that timarr - I've had no interest in Flybe (LON:FLYB) at all, so hadn't followed the situation. Hi, ok thanks Paul, they, Benchmark Holdings (LON:BMK) , do require quite a lot of research to understand, and it’s quite scientific so I’m not sure I fully understand, but, what I do understand they have huge ip in a market with long term structural growth. From memory they have some PI presentations if anyone is interested in the shares. Thanks Paul for your review of SimplyBiz (LON:SBIZ). I've started to take an interest (no position currently) and was also hesitant about the poor stockranking. 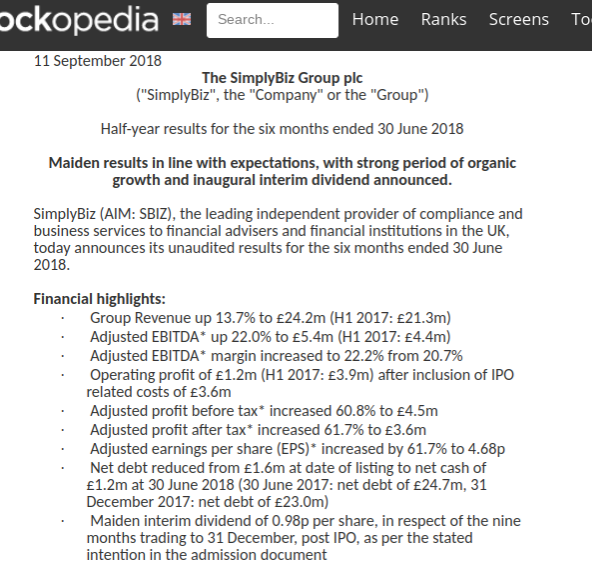 Looking back at their interim results on 11 Sept, it shows what were presumably one-time IPO related expenses of £3.6M, leaving an operating profit of just £1.2. That's what shows up in their net profit on their StockReport and presumably a big factor in the poor valuerank score? Does anyone know if those sorts of one time IPO related charges are normal? I guess as long as it was that, a one time cost, it won't matter much in longer term. FWIW i like this sector - compliance and security consulting/services is a good space to be in IMO - it requires specialist knowledge, it involves complex IT systems and data management, it's continuously evolving as part of IT and regulation (GDPR etc), and requires ongoing attention, it's not a one time purchase event. It's difficult and often not cost effective for an SME to acquire the specialist knowledge inhouse so it makes sense to turn to external expertise (just like many do for IT services). It also looks like SimplyBiz is a step further up the chain - it provides services to the companies and financial advisers who are then contracted by the SMEs - being a step removed from the shop floor should help them scale. That said, I need to do more research to make sure i've got the right picture there, & also to confirm or dissuade my current bias towards them :). I also don't have a clear view of their moat or competition. But yeah they look like interesting. If anyone has any insight into their competitive advantage (or lack of) I'd be keen to hear it!